This photodigital Image Capture is of the bottom of page five of alphabet declination notes AB Blue Bird. I go to the horses ear. I use the eye as a relative marker or reference marker. Two distinct features in the first generation–exactly an ear and exactly the top curve of an eye. As generations use this print format there might be a tendency to join the two distinct parts. It can happen in different ways if it was standardized. With alphabet declination-the final product should be a likely de-evolution from pictograph. Here I’m running through branches of variations. This is atypical. 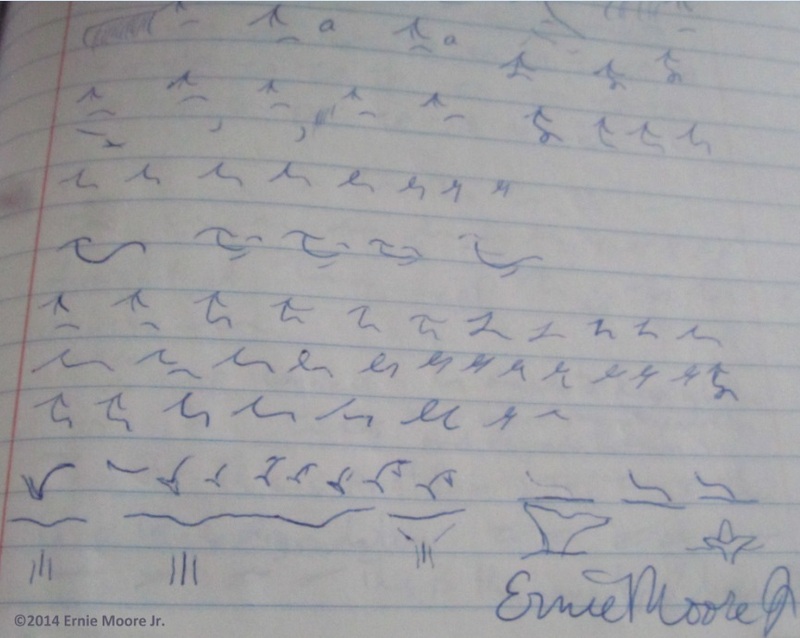 I am in essence going for a end alphabet to present, Yet, I am looking to have my usual thing of the progression from pictograph to cursive fast script that would come after generations of use.-Ernie Moore Jr. The ear looses half so one needn’t back track yet one smooth stroke to the eyelid. I also explore horizontal layout verses a more realistic. Loops are freer-faster than a point that has to be traced back down.-Ernie Moore Jr.
Next on the page is dolphin form. I use a wavy line as a base line of relevance for water. Expressing the concept of dolphin leaping out of the water I use a curve to represent the body and try a dorsal fin. later I ad a pectoral fin to add to its looking like a dolphin. Then dolphin going under water.-Ernie Moore Jr.